This large black dog was not a Newfoundland– at least as we know them today. However, it did derive from the Newfoundland. World War II was a disaster for the Soviet Union in so many ways. It was also disaster for dog breeding in the country. Private breeders of improved working breeds were virtually nonexistent, and purebred working dogs were almost impossible to find. The Soviet government knew that it needed to create strains of working dog for its military installments, but it also knew that it couldn’t just inbreed from whatever dogs it managed to get into its breeding program. So the Soviet Army set up Central Military School of Working Dogs (“Red Star Kennels”) to begin several experimental breeding programs that were designed to improve working dog breeds. One of the breeds created in this breeding program was the Russian Newfoundland, a cross between the German shepherd and the Newfoundland. At the same time, another breeding program in Belarus managed to produce a Soviet improvement on the German shepherd, which is often called the East European shepherd or Byelorussian shepherd. It was decided to start another strain of working Soviet Newfoundland in Belarus. 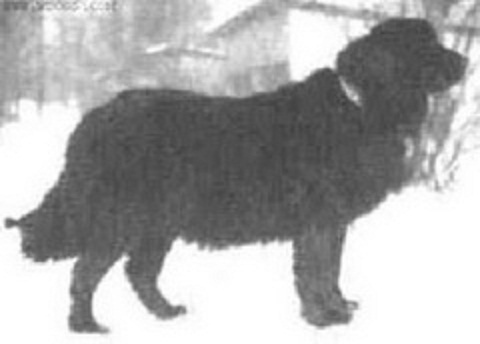 They bred the Newfoundland to the East European shepherd, and then they bred the crosses to the Caucasian ovtcharka. The resulting dog was even more cold tolerant than the Newfoundland, and it was very adept in the water. However, the Soviets had intended to produce a water rescue dog from this particular strain, and the resulting breed was just too aggressive for the job. They often attacked people in the water rather than rescuing them! Now, an amphibious attack dog might make some sense, but it was decided that this particular strain wasn’t going to be of much use. However, it did serve a good purpose. About the only distinct breed that was produced through the Soviet army’s breeding program was the black Russian terrier, a dog that started out as a cross between the multi-purpose Airedale from England and the multi-purpose giant schnauzer from Germany. Rottweiler was also a major source for the breed. However, it is also well-known for its love of the water, and although it could have received this hydrophilia from the Airedale, it also got it from the Moscow diver, which is also one of its ancestors. The Moscow diver may not have been all that useful, but its black Russian terrier descendant has become an international success. So even though it was a failure, it did produce something of value. “However, the Soviets had intended to produce a water rescue dog from this particular strain, and the resulting breed was just too aggressive for the job. So much for ‘the deed, not the breed’. Of course there is always statistical spread, and not all individuals in a breed are true to its central tendency with respect to behavior, or anything else. But the BSL pack is nuts to deny that there’s a central tendency. My cousin has two of the black Russian terriers that you mentioned. They are very protective guardians of their humans… extremely aware of any move a guest makes.